Moose Toys keeps trying to find new ways to take my money, and they keep succeeding. This time they've come out with an entirely new brand that has an appeal similar to their long-running, popular Trash Pack line, but with a few twists. These new little weirdos are called Mutant Mania. 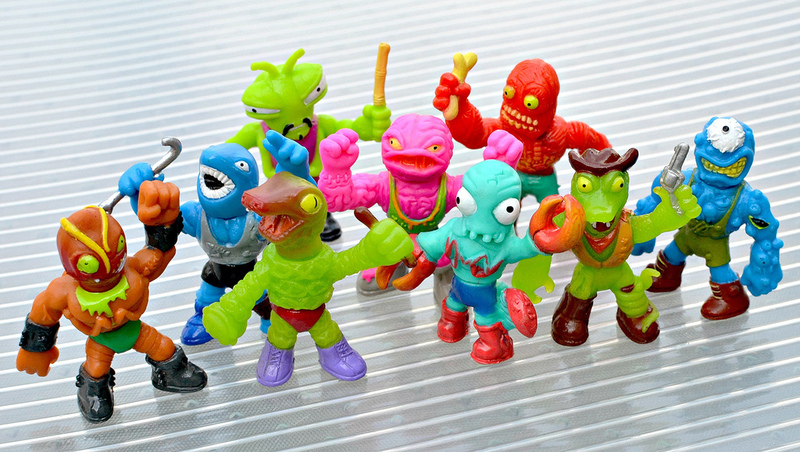 Mutant Mania features mini figures that, like The Trash Pack, consist of monsters, humanoid animals and other strange creatures with designs that are supposed to be gross or freaky. But unlike The Trash Pack, the figures are made of a firm plastic, are multiple pieces, and are twice as tall at around 1.5 inches each. 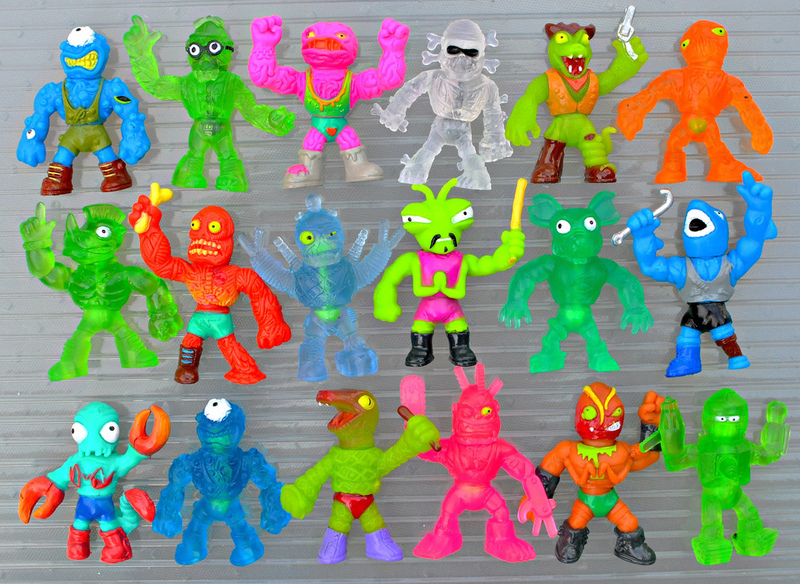 The line is also wrestling themed, although to me they come off much more as general monster toys than they do wrestling toys. The major gimmick here is that the figures are "mix-and-match," meaning you can connect pieces from one character into other characters to make a ton of different figure combinations. Each character is made up of three separate parts--a head, a torso and legs--which are held together by a rubbery "spine" that plugs into each piece. This also allows for some basic articulation by being able to turn the figures' heads and waists. I actually think this is a pretty creative, simple way to make the mix-and-match concept work, but I have seen some people say they dislike the fact that the rubber spine is exposed when looking at the figure from the back, and that it doesn't hold the pieces together as strongly as they'd like. Those gripes are understandable, but I personally haven't found those factors getting in the way of me enjoying these toys. While there are between 60-to-70 different sculpts in the line, there's actually twice as many figures to collect because nearly all the sculpts come in two different versions: A basic version with fully painted details and a clear, nearly monochromatic version. I really like this, because not only does it make the line more collectible, it should also make the figures appeal to a wider group of collectors. 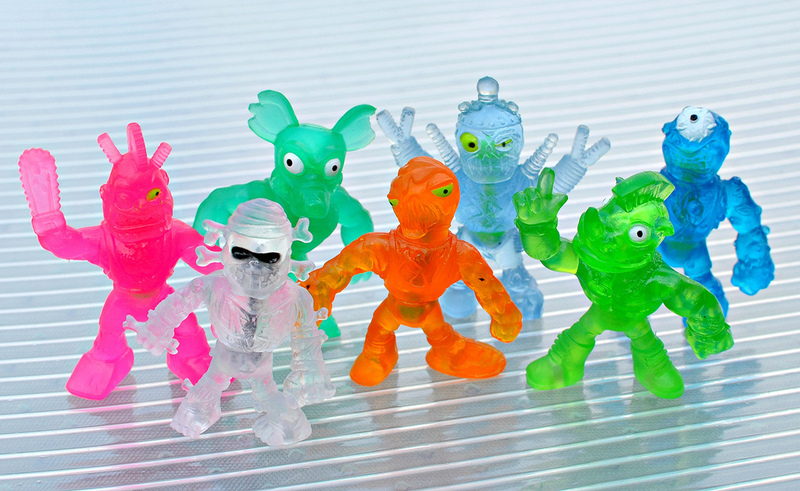 Both varieties (fully painted and clear) come in a multitude of colors, but each character is released in just a single solid color plus its clear counterpart. For example, the basic version of the cyclops character called "Eye Sore," shown here, comes in solid blue plastic with painted details, while the alternate version comes in clear blue plastic. I have a major weakness for both clear figures and figures without a lot of paint, so I naturally gravitate toward those, but I like both varieties. I really dig the sculpts on these and love how they cover pretty much all the little weirdo bases--you've got monsters, you've got robots, you've got animal-men, and so on. The figures are available in single packs (in mini can containers), carded four-packs and carded eight-packs. From what I can tell, each four-and-eight-pack includes an even number of clear and fully painted figures. 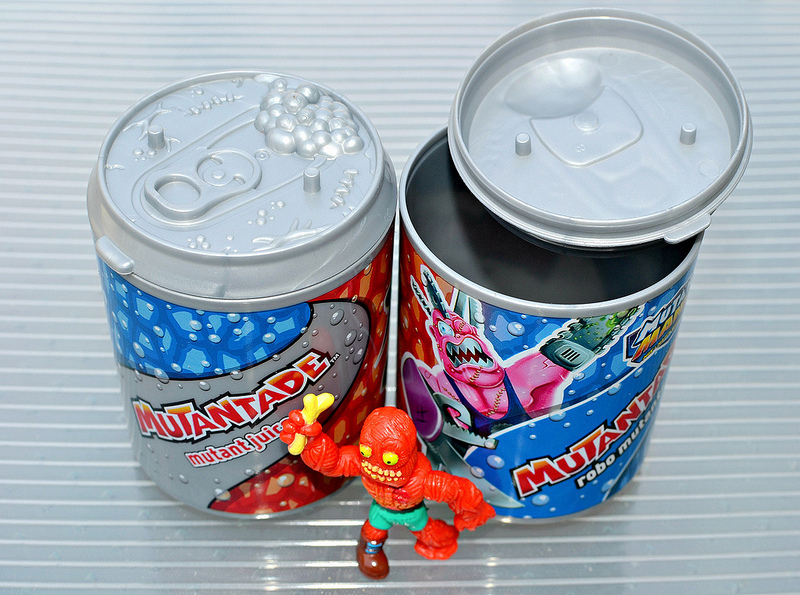 Each eight-pack also comes with a "Mutantade Mutant Juice" storage container, which is designed to look like little soft drink can and can hold around 10 mutants. 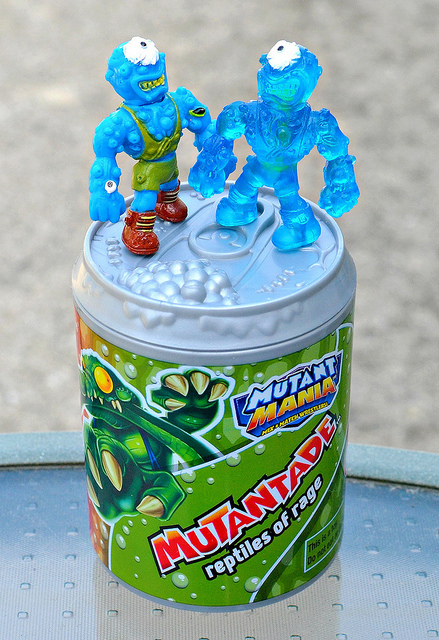 The cans also include pegs on the lids, so you can plug two figures in and pose them to battle it out on top of the can. These containers are a great little touch, and I love how they seem to be a nod to the classic MUSCLE garbage cans. There's also a couple playsets released already, including a "Mutant Masher" truck and a "Rampage Arena" wrestling ring, which I believe both come with exclusive mutants. 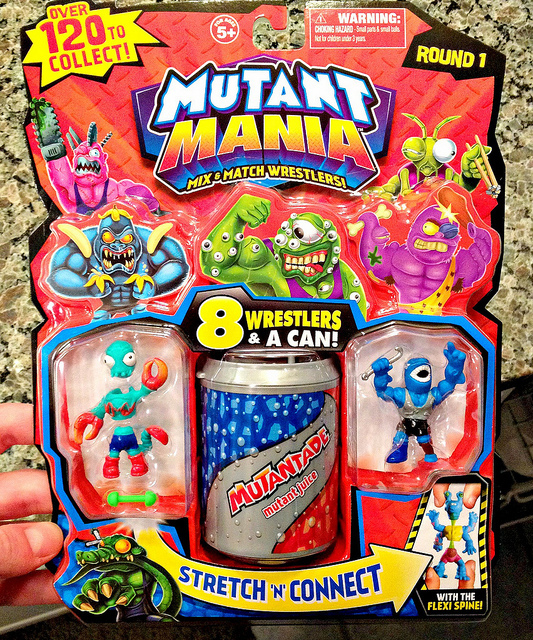 Overall, I think Mutant Mania is an incredibly fun line and I'm sure I'll be picking up some more. So far I've only seen them at Toys R Us, but I'm guessing they'll eventually make it to other stores like Target. I can really see both kids and adult collectors getting into these. To me, they have a distinct late-'80s/early-'90s feel; I've been thinking of them sort of like the toy offspring of Socket Poppers, MUSCLE and Weird Ball Wrestlers, and that's a winning combination! What do you think of Mutant Mania? Do you plan to collect them? Check out the official Mutant Mania website. If you decide to pick any up, post what you get on IG! 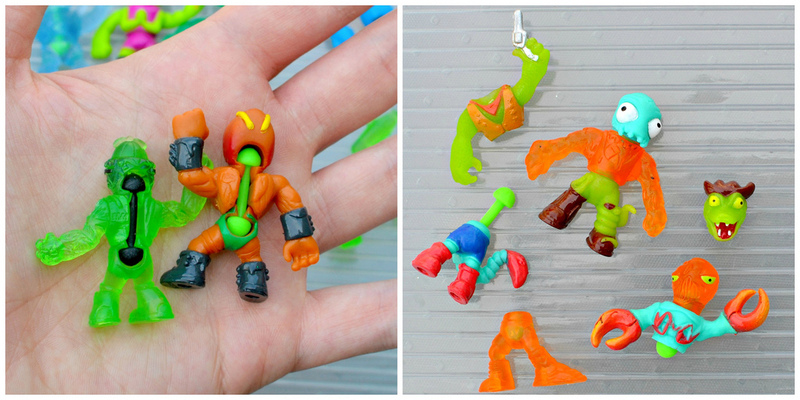 very nice review, those little guys are pretty damn cool, I need to get me the green snakeman! he's awesome. Thanks! Yeah, the snake man is great. Reminds me of an '80s fantasy toy. Love the look of these - that packaged one you've got there, is that an eight-pack with six being inside the can? I like that a lot! Trash Pack have great designs, but they're too small and squashy for my liking - these seem to eliminate both of those problems. Now I've just got to wait till they make it over here (at which point I'll be instantly turned off by how expensive they'll be sold for, ah well!). It looks like it, but the can is actually empty inside the package. The other 6 figures are hidden behind cardboard inserts. So you can still only see two you're getting until you open the package. Hope they make it over to your neck of the woods soon! until I get the maggotman! I'd like to get a Maggotman too. I don't think I've seen anyone who has posted pics get him yet. I first saw these dudes on Instagram. I've gotta hand it to Moose, they really do "trying to find new ways to take my money, and they keep succeeding." LOL! These guys would look amazing in my little wrestling ring! Where did you buy these guys? I've seen them only at toysrus here in ohio, Im still on the fence if I should start collecting them or not, Im always on a budget but 10$ for 8 figs is a pretty good. I really want the reptile rages and you can ONLY get them from 8 packs, It seems like you might not be able to escape getting a few doubles as each pack comes with the same few guys on the front. Thanks man! These are at Toys R Us. Whoa! I did not know these little guys were sorta articulated too! That definitely adds a bit to me deciding to buy a few packs or not. If only they hard articulated arms!! Actually if their arms faced forwards that wouldn't be to bad either. Moos Toys has been making lots of neat things over the years, my wife loves their line of Zelfs troll doll like figures. Yeah, they're actually pretty fun to play with because of the movement that comes from the rubber cord. This is probably my favorite line Moose has come out with, although I really like the Trash Pack Gross Ghosts as well. Great write-up and pictures as always buddy! I'm glad I gave you the heads up on these guys via Instagram haha (@BDoneArtist) keep up the awesomeness of mini life! I ALWAYS check on your site to keep me in the loop too! I only recently saw these guys at Toys 'R' Us and they blew my ever-lovin' mind. I haven't bought any yet but I badly want to. I LOVE Mutant Mania! One of my students came up to me and showed me these and I just had to find out more. My students know I'm a total comics, cards and toys freak. I bought some and they are just so well sculpted and painted. I am amazed at the detail and creativity in this line from Moose. The packaging, names and the whole nine yards! Great post, Weirdo! Thank you for reading and happy collecting!